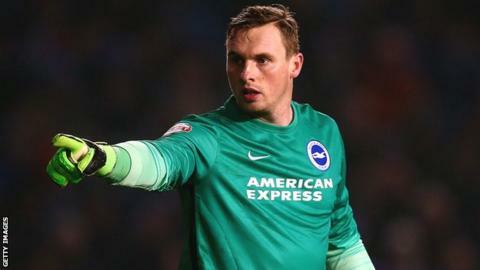 Goalkeeper David Stockdale would rather reach the Premier League with Brighton than be called up by England. With Stoke's Jack Butland out with a broken ankle, Burnley goalkeeper Tom Heaton is in line to be included in the national squad for Euro 2016. Stockdale, 30, was named in several England squads during Fabio Capello's reign but remains uncapped. "It is always nice but I would take promotion this season over an England call-up any day," he told BBC Sussex. Both Heaton and Stockdale have been ever-presents in the Championship this season, with Heaton keeping 17 clean sheets for the Clarets compared to Stockdale's 15 for the Seagulls. Brighton are third in the Championship table and Stockdale is prioritising his club commitments, despite having the ambition of playing internationally. "It is always something you work for," he said. "You don't really set goals and say 'I want to be in the England squad' because sometimes you can be unrealistic. "I know there are very good goalkeepers and I am not saying I am better than anyone. I will just do what I can do for Brighton." Albion started the campaign with a 21-match unbeaten run in the league and are now two points off the automatic promotion places, which are currently occupied by Middlesbrough and Burnley. However, with the top two facing each other next Tuesday and Brighton travelling to Middlesbrough on the final day, the Seagulls know wins in their final five games of the season will see them return to the top flight for the first time since 1983. "It is brilliant to think that we have five games and just have to look after our own business," said Stockdale. "It is a strange feeling to be this close but yet so far away. "Everyone sees the team spirit we have put together over the last few weeks. We are in a good place and all we can do is play our games."